Asian Games 2018 Day 10 highlights and results: It was another successful day for Indian contingent as the nation crossed the mark of 50 medals at the Asiad Games 2018. In the track and field events, sprinter Manjit Singh won a gold and Jinson Jhonson bagged the silver medal in the 800m race. Hima Das and co. brought a silver home in the 4x400m relay. Kurash players Pincky Balhara and Malaprabha Yallappa Jadhav secured silver and bronze. While in badminton, shuttler PV Sindhu smashed a silver medal in the women's singles event at the 18 Asian Games Indonesia today. The day 10 of the Asian Games 2018 was a successful one as Indian athletes bagged 9 medals today including 1 gold, 6 silver and 2 bronze medals. With today’s achievements, India touched the mark of 50 medals at the 18th Asian Games 2018 Indonesia. Hero of the day was sprinter Manjit Singh, who clinched a gold in the men’s 800-metre race. While the second position and silver medal was also secured by India’s Jinson Johnson. Both the players made history at the Asiad Games by winning the first and second position in the 800-metre event. 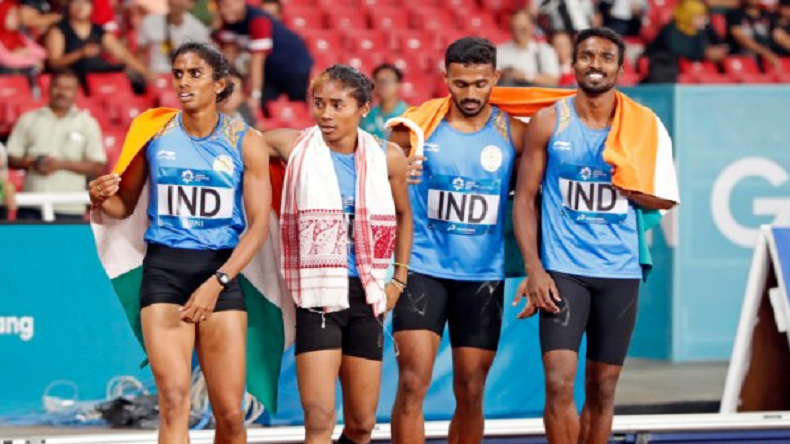 India also bagged silver in the 400×4-m mixed relay event under the leadership of Hima Das. Adding more feathers to India’s cap Kurash player Pincky Balhara bagged silver and Malaprabha Yallappa Jadhav won a bronze medal today. In badminton, ace shuttler PV Sindhu missed the gold by inches and bagged a silver as she lost to world’s no. 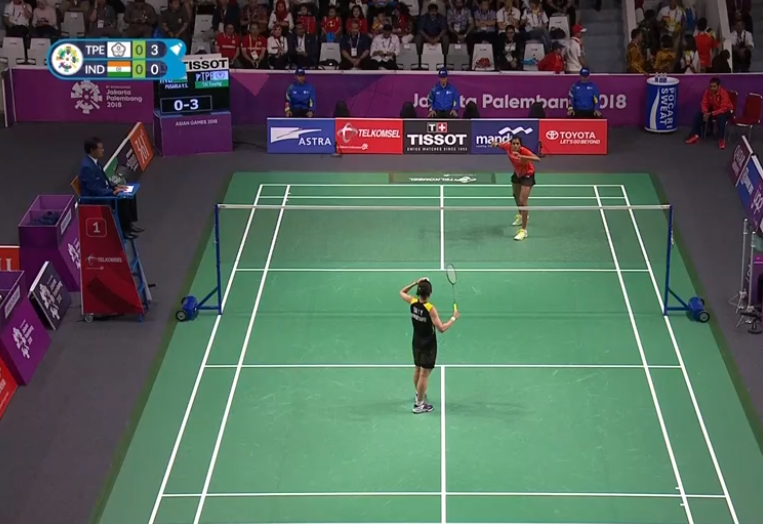 1 player Tai Tzu-Ying of Taiwan in the women’s singles final at the Asian Games 2018. Keeping the dominating momentum, Indian hockey team crushed Sri Lanka by 20-0 in their group A match. So far at the Asian Games 2018, team India has scored 76 goals with losing any match. 08:30 pm IST| India completed the day 10 run with 9 medals including 1 gold, 5 silver and 2 bronze at the Asian Games 2018 Indonesia. India also hit the mark of 50 at the medals tally today. 07:25 pm IST| Athletics: India team bags second spot in mixed 4 x 400m relay. The team comprising Muhammed Anas Yahiya, Poovamma Machettira, Hima Das and Arokiarajiv clocked at 3:15.71 and bagged silver. 06: 30 pm IST| Kurash: Pincky Balhara secured silver in women’s 52 kg event. 16:20 pm IST: Kurash: Malaprabha Yallappa Jadhav loses 0-10 to Uzbekistan’s Gulnor Sulaymanova in women’s 52kg event bags bronze. 06: 15 pm| Athletics: India bagged gold and silver in 800-metre men’s event at the Asian Games 2018. 06:00 pm IST| Athletics: Annu Rani throws 51.30m in her first attempt in the women’s javelin throw Final event, currently holding the fifth spot. 05:45 pm IST| Athletics: Sprinter Dutte Chand qualifies for the women’s 200-metre final at the Asian Games 2018. 05:36 pm IST| Athletics: Big set back for India as Hima Das disqualified for a false start in women’s 200 semifinals. 05:20 pm IST| Athletics: Sprinter Dutee Chand clocks 23.00 to top women’s 200m semifinals. 05:00 pm IST| Kurush: Pincky Balhara stormed into Semis in women’s 52 kg category event and assured another medal for India. 04: 30 pm IST| Squash: India beat Qatar 2-1 in Men’s Team Pool B match at the 18th Asiad Games. 4:10 pm IST| Hockey: India crush Sri Lanka 20-0 in men’s pool A match. 04:00 pm IST| Hockey: India has continued the dominating run at the Asian Games 2018 as India is leading the last match of the group stage by a huge margin of 20 goals against Sri Lanka.